The tour starts with an initial fast-track out of London. The drive westwards takes us back in time and deep into the county of Wiltshire. First we have the option of exploring the largest prehistoric burial mound in the country, the West Kennet Long Barrow, where once skeletons of the ancient were laid in its multitude of underground chambers. Nearby is Silbury Hill, the world’s largest man-made pre-historic mound. Strangely conical in shape, it was made unsafe by multiple excavations and thus has kept its secrets as to its use or meaning. 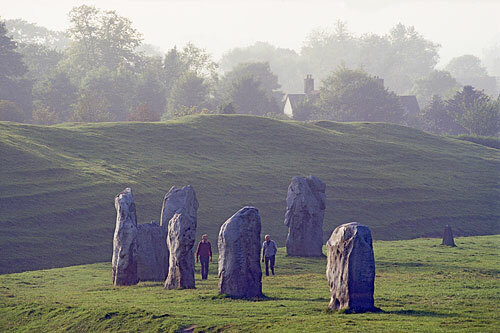 Next, we make our way to the spooky village of Avebury, locked-in by the largest stone circle in Britain. Discover the Devil’s Chair, where it is said the dark one himself may be summoned, or the murderous Barber Stone, which exacted a terrible revenge on a villager who tried knock it down. Lunch is an option at a haunted pub within the circle. In the afternoon we make the journey south, discussing along the way the huge ancient chalk carvings that decorate the slopes of local hills. Soon, we reach Woodhenge and the ancient settlement of Durrington Walls. Latest finds from recent digs around this area will help us theorise. Then our day reaches its climax, as we enter the mysterious World Heritage site of Stonehenge itself, an ancient stone structure older than the pyramids of Egypt, and a rare surviving monument of the pre-historic world. Some have a deep fascination with this place, and wonder about its meaning. Those not so swayed by the stones’ magical charms are left pondering the biggest mystery of all – how on Earth did they get there? Finally, on the drive home, reflect on the biggest mystery surrounding these places… just why did Captain Caveman become Fred Flintstone? ● Daily. Entrance fee payable. Full-day private driving tour from London with official guide. ● Duration: 9 hours. Outward driving time from London: 1.5hrs approx. ● For couples, families or small private groups (up to 7 persons).